I have a fantasy about going to live in Greece for a few months to write. It’s never going to happen of course, but the past couple of weeks have made me realise this might be just as well, or I might never see another book published. I should have been beavering away at two projects since I got back from holiday, but you can’t stay in and write when the weather’s this lovely, can you? There’s fruit to be picked in the garden, and then I have to do something with it, and the pond needs topped up, and it’s holidays, so I deserve to sit in the sun and read for a bit… You get the picture. Am I alone in this? 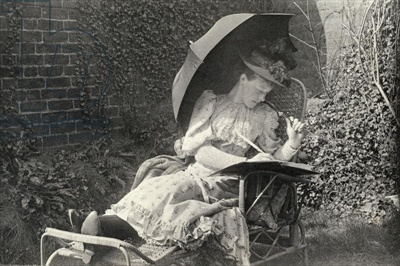 Do other writers just draw the curtains and get on with it? Please tell me! 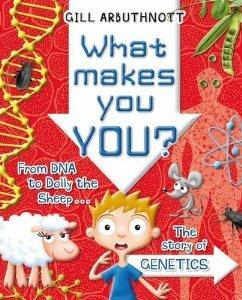 Last week saw publication day for What Makes You You? my new non-fiction DNA book from A&C Black. It looks fantastic – I’m awed by the people who take my text and bring it to life through design and illustrations. « Gerald, Lawrence and Me. I love the writing lady photo! I think probably Greek sunshine goes on forever, so eventually you’d get acclimatized and then the words would flow! (Can I come too? I’d be very quiet …) Here’s there’s always the feeling it ain’t gonna last!